What will you MAKE? 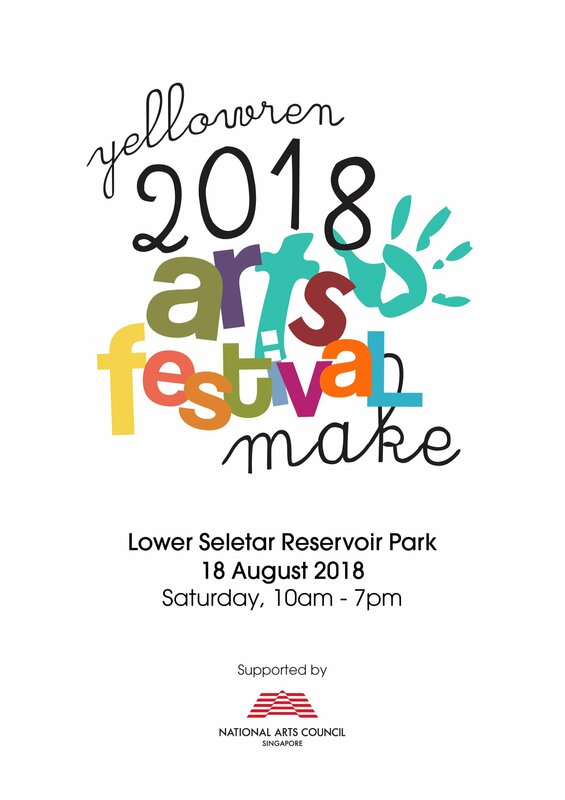 Yellowren Arts Festival returns to the heartlands for the 5th year with the theme of "Make," this 18 August 2018 with the support of the National Arts Council. Organised by Yellowren Productions, we hope to inspire you through the arts to explore the endless possibilities to make beauty and hope for our communities. Yellowren Productions invites you and your family to join us for an awesome day out at the beautiful Lower Seletar Reservoir Park. Enjoy music performances by 53A, ONLY.唯一, Shiám, Matt & Kim, and Better Than Kings. Have a go at creativity through our free hands-on activities such as cup weaving, felt art, pop art, print making and string art. Savour culinary delights from Coffee Bandits and Old Chang Kee food trucks, sedap satays from Satay Boy, enjoy ice cream and drinks all sold at amazing festival-only prices and have fun with the family. Be inspired by our local young talents in our inter-school canvas art and dance performances. Discover beauty and hope through the canvas and art installations by our local artists. We'll see you at the park! Free Admission! Edible Art by Chef Tim Ong is a fun workshop for kids. Taking his first head chef position at the age of 23, Tim Ong continued his culinary journey through working with Michelin star chefs, and being a consultant to numerous restaurant openings throughout Southeast Asia. Tim is no stranger to cooking with kids, running one of the largest children's culinary programs in Asia. Tim will be teaching kids how to make edible art with frosting and other decoration edibles out of a simple vanilla cookie sheet! With These Hands by Alvin Lee and Tommi Chan is an arts installation consisting of 111 hands made from recycled plastics. In 1907, plastic was invented to bring convenience into modern life. Yet our ignorance and neglect have embedded us in the struggle with pollution. "With These Hands" is symbolic of our fight to break free from the abuse of resources. Alvin Lee is one of the winners of Noise Singapore Award 2015, presented by National Arts Council Singapore. Local Fingerprints by Kim Hartley features Kim's inspiration from patterns and textures hidden in objects that most people would view as worthless or insignificant. Her artwork is a celebration of the intricate designs found on a tiny shell, found locally at Palawan beach. Stepped on, but not unnoticed. Arts for All offers a series of workshops for the entire family. The crafts are simple to do and you can have fun with cup weaving, felt art, pop art, print making and string art! Visit Arts for All to create and bring home your art piece! 53A features vocalist Sara Wee, lead guitarist Alvin Khoo, bassist/lead vocalist Bani Hidir, drummer Helman Kamal and keyboardist Nazaruddin Mashruddin. The aggregation of their professional experience and infectious personalities has resulted in a distinct 53A charm, which has made the band a hot favourite at 'live' music venues across the island. 53A's original album 'Settle the Kettle' debuted in 2010 and received positive reviews in TODAY, The Business Times and TIME Magazine. ONLY.唯一 , a Mandopop band, comprises vocalists, Irwin & Elizabeth, and singer-guitarist Morgan. Most recently, the duo, Irwin & Elizabeth, had come in Top 8 for THE VOICE Singapore/Malaysia 2017. As a passionate up-and-coming local band, ONLY.唯一 aspires to bring joy to all who listens to their music. Shiám is a Japanese singer, songwriter and musician based in Tokyo, Japan. She plays the acoustic guitar and has performed in various gigs and festivals in Tokyo. Her stage name is inspired by the Persian word "TIAM" that has the meaning of the brightness of one's eyes when meeting a person for the first time. EV Dance is a vibrant, performing arts company based in Singapore. EV Dance is a bridge to the community by providing local and international opportunities for diverse and engaging artistic experiences.